The frequently used software in both business and education, Microsoft Office programs Word, Excel and PowerPoint are pretty much indispensable for a vast number of operations that can be performed on a computer. Because of their decades-long tradition, it is more than unnecessary to specify their characteristics, but instead we will focus on a precise problem that arises whilst using them. In the process of sharing these files between differing devices and computers that have contrasting operating systems, severe problems can occur because each of these devices/computers have their own unique way of deciphering the data that is inside every file, thus making the document partially, or entirely unviewable. This of course doesn’t happen if the computers have identical OS, but there is a large possibility that it won’t be the case, and if the file you’re sending is significantly important, you shouldn’t really take that kind of a risk. To avoid such distress, a user should always convert the file to PDF prior to sending. The special ability of this file format allows it to be viewed on every known device and operating system (because of its ubiquitous formatting), and that can be achieved from every Office program directly. On the other hand, the main lacking of the Portable Document Format is that it is read-only in nature, which basically means that the receiver cannot make any changes to it when it reaches him, and these types of files often require edition once they reach the recipient. 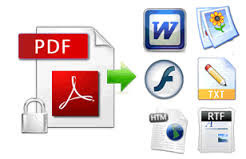 There is a way to overcome this of course, and the next course of action would be to use specially designed software that extracts all the data inside the non-editable PDF, and makes a new version of the previous Office document, which can again be manipulated in every possible way. The majority of these programs are either too expensive (they are used by professionals who require this type of action on a regular basis), or the free tools that can be found online (plenty of them often offer unsatisfying results). We found a high-quality online tool that can meet your expectations, and it also has a premium version, for more advanced users. For the sake of demonstration we will concentrate on the PDF to Word conversion, but the exact steps are also for PDF to Excel, and PowerPoint. that’s done, pick the PDF file you desire to transform. 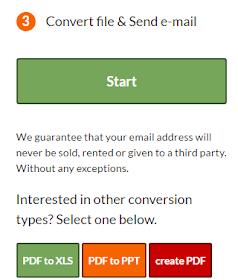 The next step is to enter your email address, where the download link will be sent to you once the conversion is complete. That’s pretty much it, all that’s left to be done is to start the process, and check your inbox a couple of minutes later (the time needed for the tool to finish is dependant on the size of the file, and the number of users currently operating the tool). 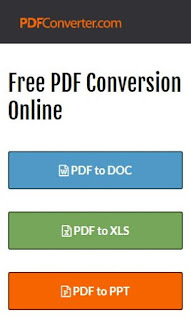 Give PDF Converter a go next time you have a sneaky PDF messing up your workflow, and lessen the overall time focusing on this burdensome issues.